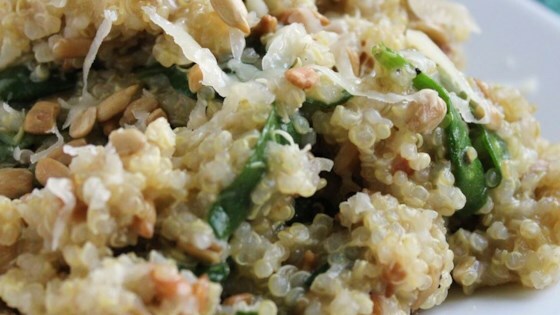 "This creamy pilaf incorporates the fluffy, nutty-flavored grain, quinoa, with a decadent and delicious goat cheese gouda. This has an amazing flavor and texture. Try serving with steamed salmon. I think this would work well with pine nuts as well as a variety of other cheeses. Try regular goat, Parmesan, blue, etc." This was ok. We couldn't taste the garlic, spinach, or cheese....just the quinoa. I'll try it again but with more garlic and cheese. It has potential. What a great recipe! So easy to make and very nutritious. I used parmesan cheese and served with grilled halibut and steamed brocoli, it was delicious.